Simple Regeneration Age Resisting Cleansing Wipes contain the perfect blend of ingredients to help fight premature ageing whilst cleansing your skin of dirt, make-up and impurities. The soft textured wipes thoroughly cleanse the skin removing impurities, make-up and dead skin cells. These facewipes are made with gentle cleansers, purified water and skin loving ingredients such as Pro-Vitamin B5 and vitamin E. Our facial wipes, just like all Simple wipes contain no artificial perfume or colour and no harsh chemicals that can upset your skin. 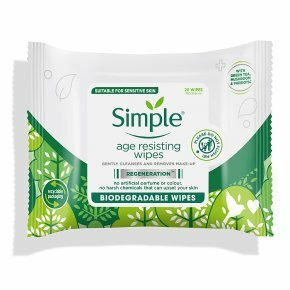 These Simple age resisting wipes are suitable for all skin types, even the most sensitive skin. Non-comedogenic, hypoallergenic, dermatologically tested and approved to really be the UK's No.1 for Sensitive Skin Wipes. Everyday cleansing can be harsh on skin. Simple Regeneration Age Resisting Cleansing Wipes contain the perfect blend of ingredients to help fight premature ageing. The soft textured face wipes thoroughly yet gently cleanse the skin removing impurities, make-up and dead skin cells. Made with gentle cleansers, purified water and skin loving ingredients such as Pro-Vitamin B5 and vitamin E. Does not irritate skin or leave residue. Skin is left feeling thoroughly clean, fresh and hydrated. As with all Simple products, there are no artificial colours, no alcohol, no harsh chemicals and no perfume that can upset your skin. Designed for sensitive skin and loved by all skin types. Dermatologically tested and approved. The cause of premature aging are many, and one of them is exposure to sun rays without protection. It is important to use skincare products that contain UV filters to combat the sun's damaging rays, and skin nourishing ingredients that help to restore skin's barrier function. Skin ageing is affected by 3 factors - the genes you were born with, hormonal changes, and your lifestyle. Things like smoking, stress and sun exposure all contribute to the acceleration of wrinkles. Try the Simple Regeneration skincare range to help your skin fight the signs of ageing. For other convenient cleansers, make sure to try our Simple Micellar Wipes and Simple Exfoliating Wipes!